Expand your know-how about fire inspection and plan examination. 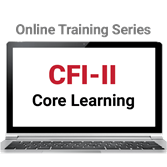 Take the CFI-II Core Learning Online Training Series -- including vital training on NFPA 13, NFPA 25, NFPA 72®, and NFPA 101®. Get advanced training in key elements of your work with the CFI-II Core Learning Online Training Series. This high-impact training helps give fire inspectors a critical understanding of concepts in widely adopted NFPA codes and standards including NFPA 13, NFPA 25, NFPA 72, and NFPA 101. Convenient online instruction lets you work at your own pace to gain the type of knowledge needed for job success, and helps you prepare for certifications such as the NFPA® Certified Fire Inspector II (CFI-II) program. Complete this five-hour course series and qualify for 0.5 CEUs. Completion of each individual one-hour course qualifies you for 0.1 CEU. Upon successful completion of a course or the course series, participants will be prompted to download the CEU certificate directly from the course site.